The paint is finally dry on the series of miniature still life paintings I created about ten days ago. You can view my original post about this series here. 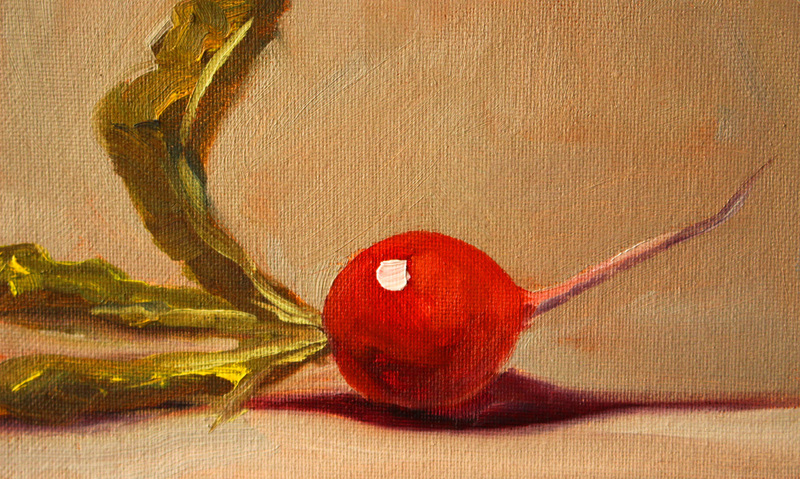 This little radish painting is one of my favorites. It was created with oil paints on a 5x7 inch flat canvas panel and is available here, in my Etsy Shop. When it has sold, reproductions will also be available. Visit the Still Life Gallery at my print shop for more information about sizes and other options. 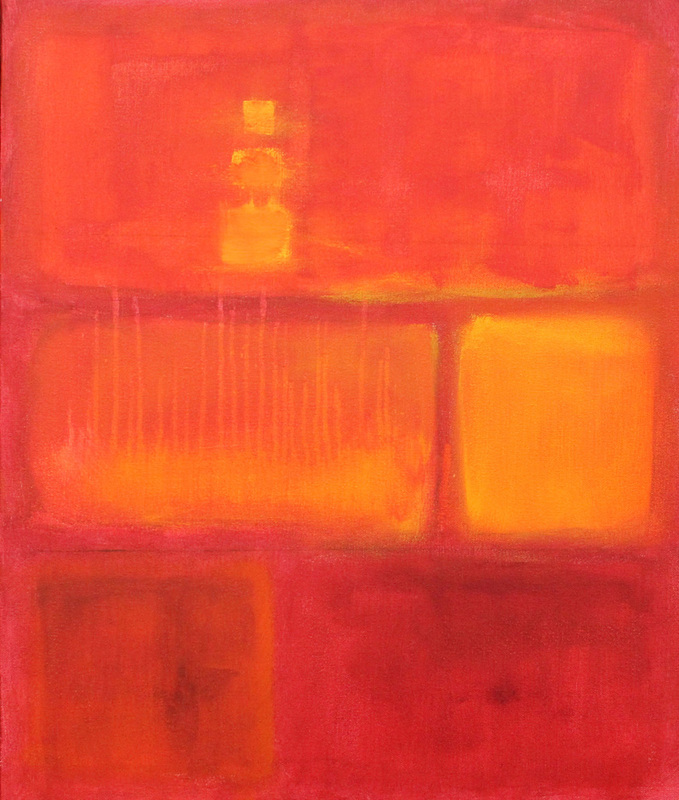 This painting is about the color of emotion. It was created with layers of transparent color, crimson, red, and magenta. Yellow and orange are bundled together in geometric shapes. This painting is on a 20x24 gallery wrapped canvas with finished edges. Contact me at smallimpressions@hotmail.com for purchase information. Fall is here. The weather is cool and the rain showers of the Pacific Northwest have begun. 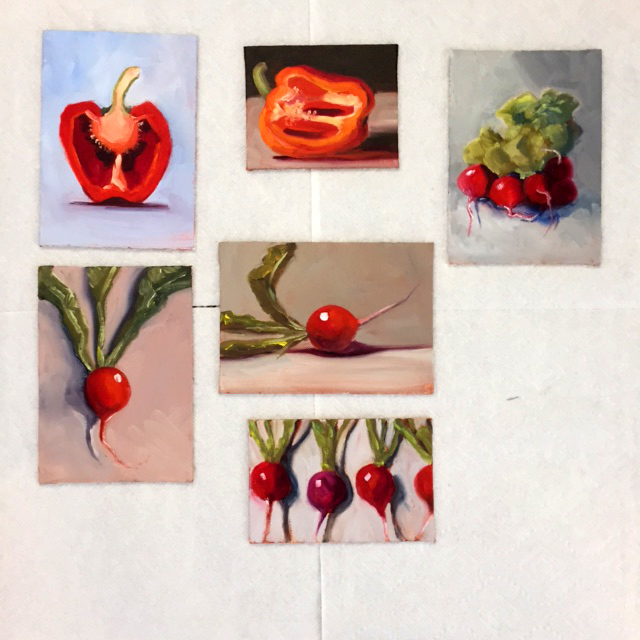 It was the gloomy weather of mid October that prompted me to paint this series of colorful little still life paintings. It has been a long time since I focused on small still life oil paintings, so I thoroughly enjoyed painting these little ones. All included some bright red to chase away the gloom. They range in size from 4x5 inches to 5x7 inches. They are painted with oils on canvas panels. As soon as they are dry, I will be selling them in my Etsy shop. Hope you will stop by. Inspired by the autumn season, this 11x14 inch acrylic painting has been added to my Northwest travel series inspired by my recent road trip. There are several in the series that have been added to my Etsy shop where I sell my small format original paintings. 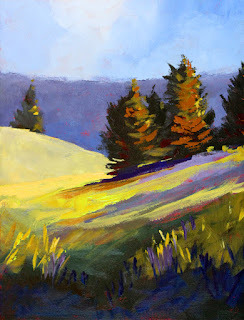 Hope you will stop by and check out my paintings of fields and trees. You can view a larger version of this painting here.